PT PAM Lyonnaise Jaya (Palyja), the operator of clean water provision and service for West Jakarta is going to relocate intake pipes in City Park's Water Management Installation on April 17-20, 2015.
" Relocation is ongoing since today until next Monday. 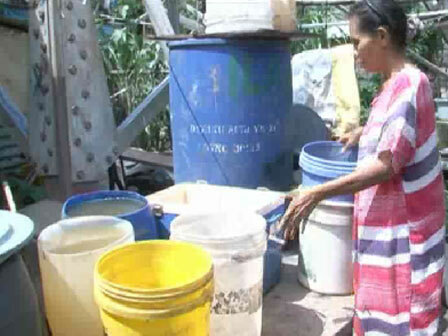 Clean water supply will be back to normal gradually on Monday at 2 PM"
Such relocation causes clean water supply to 10 urban villages in West Jakarta is disrupted. Those 10 urban villages are Kembangan Utara, Rawa Buaya, Kedaung Kali Angke, Kapuk, Cengkareng Timur, Cengkareng Barat, Tegal Alur, Kamal, Pegadungan, and Kalideres. Head of Communications and Social Responsibility Division for PT Palyja, Meyritha Maryanie stated the relocation was conducted for supporting normalization program of Cengkareng River Drain by the Ciliwung-Cisadane Flood Control Office (BBWSCC). "Relocation is ongoing since today until next Monday. Clean water supply will be back to normal gradually on Monday at 2 PM," she said, Friday (4/17). To anticipate disruption of clean water supply, her side will add the Booster Pump for increasing higher pressure thus the costumers who are located away from the installation could be served well. Besides, his side also has prepared free water tanks for emergency like in hospital. He also appealed the customers to fill their tubs and save water use. "We apologize for the inconvenience," he disclosed.